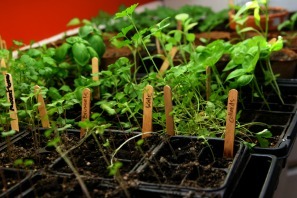 If you haven't tried growing vegetable seeds into seedlings in the past, perhaps now is a good time to give it a try. Gardening is a great hobby and growing vegetable seeds into seedlings will give any vegetable gardener great satisfaction and pride to see tiny shoots spring from the soil. Each year I can't get over that feeling as I anxiously wait for the first seed to germinate and emerge from the soil. Like a mother hen, I tend to these little shoots with care until they grow into fully grown seedlings ready for planting. Two popular questions I am frequently asked by beginner gardening enthusiasts are "how do you store seeds," and "what is the best time to plant seeds?" Well...There are two ways you can grow seeds into seedlings. You can collect the seeds from last year's crop or you can purchase them from your local Nursery, Home Depot, Lowe's, or a seed supplier on the internet. Purchasing seeds is the most straight-forward and simplest way to grow vegetables, you only have to follow the instructions on the packet. However, I would like to point out a very important fact I have learned throughout my many years of growing vegetables. The success of a great vegetable garden yield is in the quality of the seed. Vegetable seeds have a shelf-life and are usually classified as "Short-lived seeds" (usually one or two years), "Intermediate seeds" (three to four years), and Long-lived seeds" (five to six years). Below is a suggested list and classification of the more popular vegetables gardeners tend to grow and you may recognize some of your favorite vegetables as well. Short-lived vegetable seeds consist of:- onion, pepper, sweet corn, parsnip, and parsley. Intermediate vegetable seeds are:- tomato, spinach, carrot, bean, broccoli, and pea. Long-lived seeds are:- cabbage, melon, cucumber, eggplant, and squash. When you collect your seeds from last year's gardening, the seeds need to be stored until ready to use for next year's planting. Air-tight glass containers (screw top lids or jam jars) or plastic bags such as zip-lock bags make great storage containers. I use to use glass jam jars to store my seeds, you know the ones with the rubber gasket on the top. Clumsy as I am I broke more containers than I saved, so I decided to try zip-lock bags and found they work just as well. Whether you use air-tight glass containers or plastic bags (don't use plastic bags with twist ties as they are not air-tight), your stored seeds must be kept cool and dry (that is without moisture accumulating inside) and they must be stored in a dark area. A month before spring rolls around it's time to remove your vegetable seeds from storage and begin planting them in small seedling containers. Place a clear plastic cover over the trays or pots to hold in moisture while seeds are germinating. But before we do this we should check and make sure they will indeed grow. An easy test I use is to take several seeds from each container and wrap them in a moist paper towel. Next place them in another zip-lock bag or any type of sealable bag and place them in a warm location in the house (such as the kitchen window sill). Then check the seeds every few days to see if they have germinated. At the end of ten days, any seed that will germinate will have done so. If a small percentage has sprouted that's ok, you can still use the seeds; just plant more than you'll need to compensate for the loss of seeds that won't germinate. Most vegetable seeds take three to four weeks to grow into seedlings and become mature enough to plant in your garden, so as mentioned above start this process a month before planting time. For those of you who would prefer to have most of the prep work removed in getting your seeds growing, Burpee Seeds is a great idea. Here is a great vegetable website resource I recommend you also read. Vegetable-gardening-advice.com. Your complete guide to beginner vegetable gardening, including a section on vegetable-plant-identification.